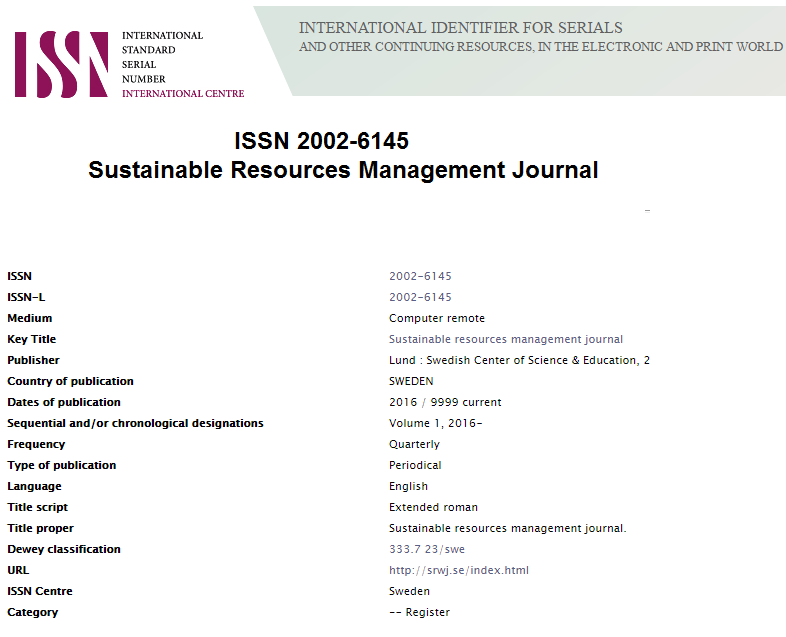 Sustainable Resources Management Journal (SRMJ) is an International, peer-reviewed, interdisciplinary, monthly, and fully refereed journal accepting original and high-quality articles covering a wide range of topics in scientific research, dedicated to promoting high standards and excellence in the creation and dissemination of scientific knowledge. SRMJ is an open access journal that publishes papers submitted in the English language. SRMJ focusing on natural science field of studies including: water resources management, sustainability of water resources, hydroponic, Aquaponic, ground and surface water quality and quantity, water use and reuse, biodegradation of organic pollutants in a water, desalination, engineering solutions and technological innovations relating to water management, social and environmental studies relating to water, chemical, physical and biological contributions relating to water, environmental restoration, including research on soil and groundwater, biofilters, bioremediation, sustainable waste management, food waste, recycling, waste to energy studies, sustainable urban design and renewable energy. SRMJ welcomes author submission of original and significant contributions. We accept to publish: Research papers; Working papers; Short communications; Case studies and Literature surveys. All submitted manuscripts are initially checked by the responsible editor. If the manuscript authorized by the editor for possible publication, the manuscript are sent to a minimum of 2 reviewers in the field. Two weeks were given to reviewer. Final decisions (acceptance. Acceptance with minor revision, acceptance with major revisions, and rejection) are normally made by the responsible editor after following comments and suggestion made by reviewers with authors. All submitted articles should be original, previously unpublished research results. Submitted articles must not be under consideration for publication elsewhere. SRMJ is Non - an profitable entity that offes scientist publishing services in open access fully refereed journal accepting original and high-quality articles. Consultancy organization with vast and rich experience in water and desalination; waste management and waste to energy solution. The primary aim of Consult Lund is to raise environmental awareness and provide high-quality information on environmental sustainability, energy, waste and water.